For those who like to lounge in style, our signature dressing gowns merge classic styling with modern fabric designs. Available in wools, cashmere, cottons and silks, a Derek Rose dressing gown is an investment made to last. Our men’s pyjamas are crafted from luxuriously soft cotton, silk and micro modal fabrics for indulgent comfort. With a style to suit every man – choose from classic or modern fit and long or short length pyjamas. Designed to pair with our t-shirts, we make our trousers and shorts from a variety of fabric weights and patterns - ensuring there is a comfortable and stylish trouser or short for every man. Designed to wrap you in pure comfort, our women's dressing gowns and bathrobes are handmade from the softest cottons and finest silks for elegant downtime wear. Perfect for adding elegant comfort to your evening, our women's pyjamas are made from exceptionally fine cottons and the finest Italian silks for added nighttime luxury. Indulgently soft and comfortable, our women’s micro modal and cashmere trousers can be worn for sports, long haul flights or simply to lounge around the house in pure luxury. Bedtime has never been so easy with our boys pyjamas. Fun prints and patterns combine with our supersoft pure cottons for the softest nighttime sleepwear. Our girls range of nightwear follows the ethos of our adult ranges, ensuring "Smart Comfort" is at the heart of every design. Find the perfect gift for him with our selection of luxurious off-duty gifting favourites for men. This Christmas, we've hand-picked the must-have gifts we'd want wrapped under our tree. Find the perfect gift for her with our selection of luxurious off-duty gifting favourites for women. This Christmas, we've hand-picked the must-have gifts we'd want wrapped under our tree. Our range of luxurious matching lounge, leisure and sleep sets make for ideal self-indulgent gifts for you and your partner or as a his and hers gift-set for your favourite couples. Featuring a flattering A-line body, adjustable spaghetti straps, side vents and a deep V neckline with bust darts for a tailored shape, our chemise nightdresses come in luxuriously soft cottons and silks, designed to keep you cool, comfortable and stylish during warmer nights. Think of them as a longer version of our camisole PJ tops, with a just above the knee finish. 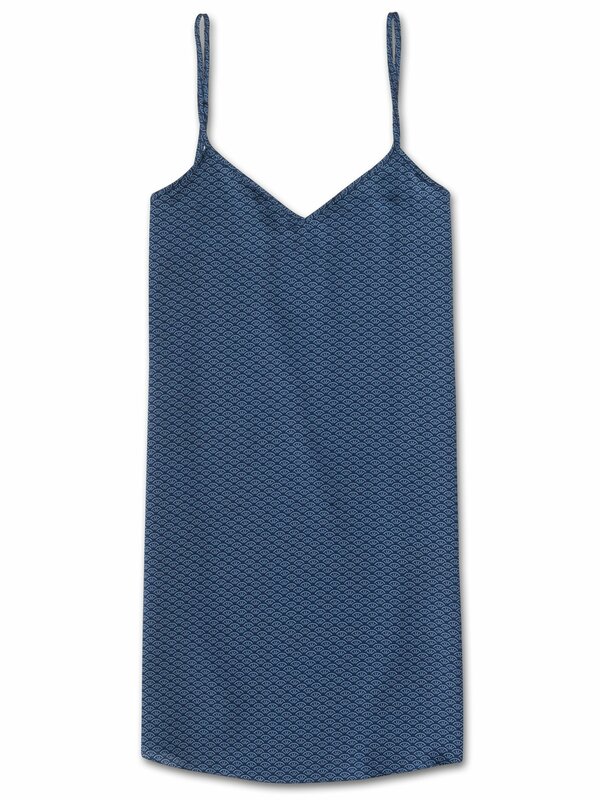 With its navy base and repeated light blue Japanese 'fan' motif print, the Brindisi 26 women's silk chemise is both stylish and luxuriously comfortable. Produced in extremely limited quantities and the result of hours of loving craftwork by our skilled pattern cutters and seamstresses in our Cheshire, England workshop, this luxury chemise is cut by hand to ensure we maintain the supremely soft and smooth satin finish. A dream to lounge or sleep in, our chemises are also perfect for travellers and holidaymakers, as they're not only comfortable in warm climates, but also light to pack and easy to carry. The model is 5'9" / 175cm tall with waist size 25inch and bust size 32inch. She wears a size small. Orders made by 15:00 (GMT) will be dispatched the same day. All deliveries are tracked and a signature will be required upon delivery. Please note, DHL does not deliver on a Saturday. Please note if you live outside the EU, local customs or import duties may be charged when your parcel reaches your destination - recipients outside the EU will be responsible for any import duties, clearance fees and any other additional charges. Derek Rose is a British lifestyle brand specialising in luxury nightwear, loungewear, leisurewear, resortwear and underwear.